AMAZING, HIGHLY ADDICTIVE and EXCITING!!!! Do you Want the NEWEST and most EXCITING challenge on a classic that's even crazier then anything ever before, Well then look no further !!!! If you DARE, try our newest game ! -Makes this game inevitably FUN and a must PLAY experience! 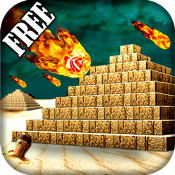 PLAY your way through the levels destroying the 3D objects if you DARE! Move the ball around the game board with the paddles as you try to destroy the 3D object in the middle, unlocking hidden items while earning you points. Collecting these new items and earning new points will REWARD you with new lives, coins, multi balls and more! When you pass each level you will get a BONUS REWARD as your points will then convert into more coins! YOU can then choose to collect or use these NEW coins to unlock any of the AWESOME new items and features offered in the customization options! - HURRY!!! Don't Hesitate, come PLAY and discover your first hidden level item Today!